If dice are the weapons of a fantasy gamer, then maybe they deserve these new Dice Guards from Dog Might Games. 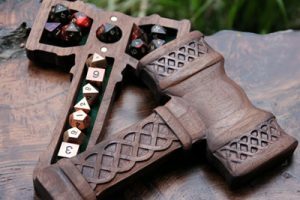 They’re handcrafted wood dice storage boxes in the form of fantasy armament: hammers, axes, and maces. Normally, they retail for $80-100, depending on the choice of wood. However, the company does have a few in-stock at 20-40 percent discounts.